My first thought when taking one of each color out of the pack was “WOW” as these are bright. The pink, orange, yellow, and green are the brightest while the blue is just okay. I especially enjoy how the traditional green imprint and green and yellow ferrules have remained the same on these pencils. 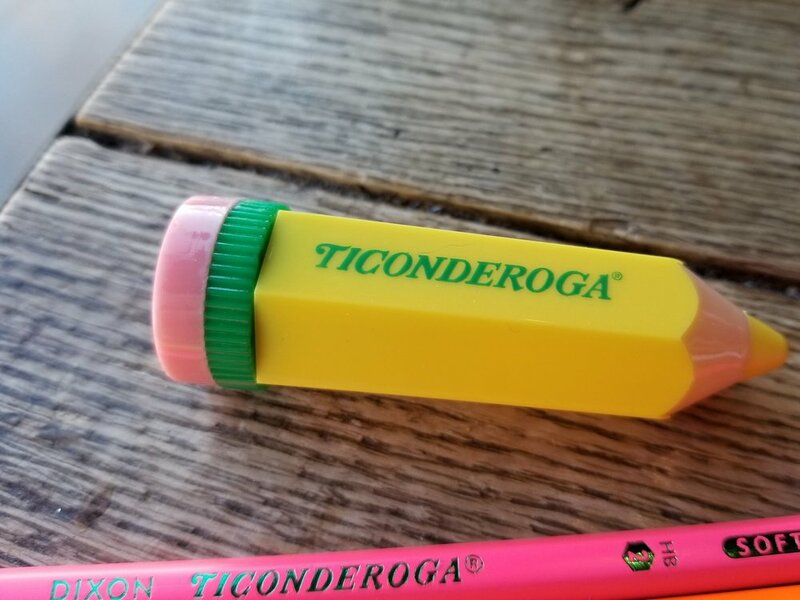 It’s Ticonderoga’s “thing” and I’m glad they didn’t change it up with say a black ferrule or something. The erasers match the barrel of the pencil and are a nice touch. It really pulls together the whole neon theme. The juxtaposition of bright neon colors sandwiching the traditional yellow/green really makes the whole thing work. The core of these pencils are the common “soft” core (HB) that most Tics have. These pencils are made with basswood and not cedar which is kinda disappointing because for a while you were able to still find some cedar Tics on store shelves. The core is consistent in the sense that it writes just like all the other current day Ticonderogas I own. There is no grittiness and point retention is about average for an HB core. The provided eraser does a pretty crappy job completely erasing the dark marks that this pencil lays down, but that’s an easy fix (cue: Hinodewashi). The sharpener that comes with these pencils is mediocre. It sharpens, sure, but the point is left brittle and almost always breaks when writing for the first time. It’s good to use in a pinch, but I’d ditch it for something a bit more functional. Overall, I love these pencils— they perform like they should and they look great. As far as whether or not to purchase them, that’s up to you— do you like neon? If yes, buy. I mean, that’s the only reason you should pick these up as they are just like a traditional Ticonderoga with a different paint job. I don’t always grab a Ticonderoga for my everyday writing (I usually use a Neon Casemate or a Blackwing), but this pencil just might make it into my rotation because it makes me happy looking at it. Really, at the end of the day, isn’t that what matters most? Using something that bring us joy? Ever since I reviewed the Blackwing 211 a few weeks ago, I have been in love with pencils that have an unpainted, natural look. Now there are two categories of natural pencils: "finished" which is what the 211 was and "raw" which is what the Ticonderoga Renew is. I have no real preference for either, but performance wise I did notice a few interesting things about this "raw" pencil. I really like the color scheme of this pencil; the green eraser, the classic Ticonderoga ferrule, and the green foil stamping really make the natural barrel shine. I also like that on most of the pencils in the box I have, you can see the interlocking wood slats which I think is super cool. The Renew sharpened up nicely and the graphite core was perfectly centered. There was slight resistance when sharpening the Renew; it was almost as if the raw finish gave me a bit of resistance while turning the sharpener. This did not effect the sharpening process, it just made it a tad bit more difficult (I also worried that it was a bit rough on the blade of my Masterpiece). Because the Renews are made with a little over half of pre-consumer recycled wood, I am unsure what the make up of the pencil is. It definitely has a smell to it that is unique and not very cedar-like (actually-- and don't laugh-- it kind of smells like strong body odor when sharpened). The eraser was effective, but was very dusty and wore away about halfway through the pencil. I had to resort to using my Mitsubishi Boxy the rest of my time with the Renew.